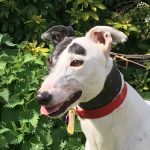 We all know the Greyhound is a big hearted dog with lots of room for love. Did you know however that the Greyhound has a heart size that is also on average 10-15% bigger than other, less athletic breeds? A heart murmur is detected often by a Veterinary Surgeon when they are carrying out a physical examination. This includes listening to the chest and heart sounds. In an animal without a heart murmur the normal rhythm is Lub-Dub. In a patient with a heart murmur the normal sounds are associated with a “swoosh” sound. A heart murmur occurs when the normal silent flow of blood through the heart is disturbed by vibrations. In very athletic dogs and lean breeds such as greyhounds they often have a stronger cardiac output than other breeds and so it is not unusual to hear a murmur as the flow of blood through the heart is stronger and so therefore will cause extra vibrations which are described as a murmur. 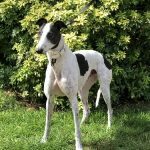 It is likely that the Veterinary Surgeon who examines your greyhound will give the heart murmur a grade. The standard grading system for heart murmurs is grade 1 to 6. The grade does not tell us the severity of heart disease if in fact there is any, it just tells us how intense and loud the murmur is. Not all animals with a heart murmur have underlying heart disease. In the same way some patients can have severe cardiac disease in the absence of a heart murmur. In some cases the only signs of heart disease we see are end-stage and these patients will often have no history of having a heart murmur. The presence of a heart murmur as a stand- alone clinical finding is not indicative of heart disease particularly in these very athletic breeds. 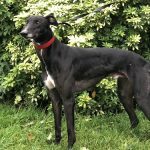 They will often have a heart murmur and live a completely normal life, be able to continue with normal exercise including the flat out running that they are so well known for. They will also be able to go for the normal longer walks on nice days and enjoy a happy and long life. Greyhound hearts are 10-15% larger than the normal canine due to the athleticism of the breed. They need a bigger “pump” than other breeds due to the “job” they have been bred to do. The presence of a heart murmur on its own does not mean that a dog has heart “disease”. They can live a completely normal full and energetic life even if they are diagnosed with a Heart Murmur. Heart Murmurs that have been stable and have not changed grade for 1-2years are less likely to cause problems in your pet`s day to day life. Whilst it is important to recognize that these pets can develop heart disease at a later time in life (the same as with all dogs) the presence of a murmur does not mean they absolutely will. The only additional recommendation for a pet that has a heart murmur would be for it to be seen by a Veterinary Surgeon (ideally the same one) twice a year to re-grade the murmur. The above information is for reference only and not a replacement for a Veterinary Surgeon assessing your pet`s heart and grading the murmur on a regular basis. In the majority of cases a patient with a heart murmur can be stable for many years and may eventually develop heart disease. The author takes no responsibility for any decisions regarding re-homing of a dog with a heart murmur. 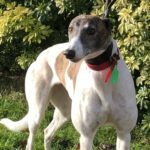 From time to time we have greyhounds come to us that are subsequently diagnosed with a heart murmur. 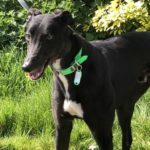 Regardless of the grade diagnosed those greyhounds are very often overlooked for adoption for a very long time compared to the residents that do not have a heart murmur. 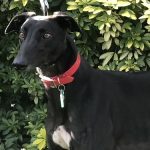 We asked Katherine if she would write us a piece about heart murmurs, in simple, non-jargon terms, that would present these generally perfectly healthy greyhounds in a more favorable light to potential adopters. Thank you Katherine for your page and all the research time that you put in to create it on our behalf. 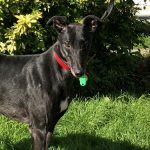 This entry was posted in Information and tagged greyhound health, heart murmurs by Marie.